You might have already decided that extensions aren’t for you – that you can’t be doing with the faff of the application, the upkeep, the constant care. And that’s cool – but what if you had, at your fingertips, temporary helpers that could give you a fringe in a flash, or a dip dye do directly, for one night only? Just look at Kylie Jenner’s ever-changing hair and you’ll realise that very little of what you see is, well, her hair. She has a collection of wigs and pieces to change it up on the regular, and we can totally see why. Want green hair for a festival? Done… but without the bleach and the regret you might have a week later. Fancy a super long pony but your bob says no? Not a problem, we can clip in a tail any pony would be proud of. First up, what you need to know – it is worth spending a bit more on pieces, otherwise after a few washes you mind have something more akin to dog fur than a ponytail. Lots of the brands in salons offer human hair extensions and pieces, so check with your hairdresser on the quality. “It’s really important to go to your stylist for this to get the right colour match and fitting. 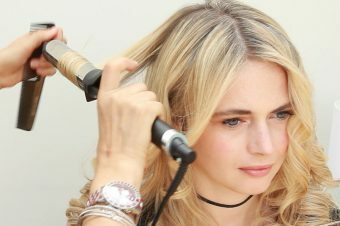 This would give the stylist time to blend the extensions with your own hair and also show you how to correctly fit them for the best effect,” says salon owner Inanch Emir, who’s also the expert behind Gold Class Hair. Remember to use a Tangle Teezer to remove knots and hairspray before washing, and make sure you wash and condition the hair in the right direction of the hair piece, to avoid any nasty tangling. Once washed, use your detangler again and blot dry with a towel – don’t rub the hair. “It’s important to use a detangler on wet hair to avoid damage, as this is when the hair is at its most fragile,” says Angela. Then use a heat protector before drying with a paddle or ceramic brush. So those are the basics covered. Now onto the fun! With Christmas party season about to kick off, we examine the key extension essentials any gal should have in her wardrobe. Shopping for two wardrobes? What’s not to love…? Now, we’ve said “the plait” – but there are sooooo many, and you can choose your length too. all types, lengths and kinds. A braid clip-in is also super versatile, as you can use it to create a messy top knot, a fishtail, boxer braids, braided buns, milkmaid braids… see where we’re going with this? 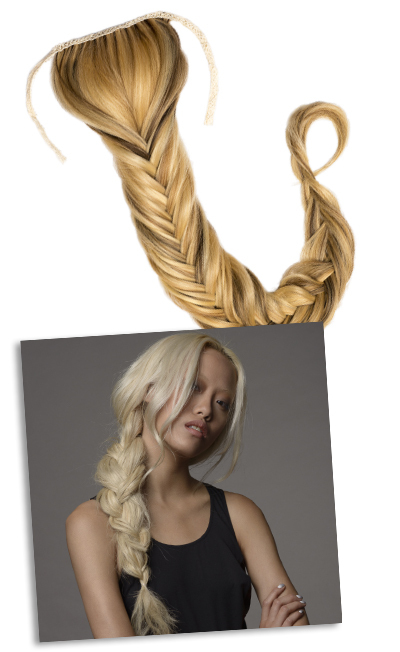 The Tatiana Karelina Clip-in Braid (from £250) is a favourite, and really easy to clip-on, even on short hair. Ever pulled all your hair back into a top knot, only to be disappointed by the sad, tiny lump that results? Fear not, there’s a clever and easy way to fatten it up! 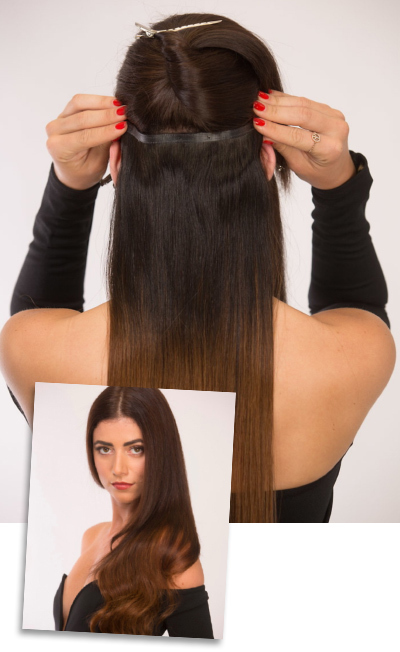 The Remi Cachet Human Hair Wavy Wrap (RRP £24.95) is really simple – just twist the Wavy Wrap two or three times around or bun (or ponytail) to boost its oomph, and then pin in place to get the result you want. It can be worn high on the head for a statement look or low for something a little more elegant. There is a super wide choice again, of colour effects (ombres for example, or pastel shades) and of different lengths. 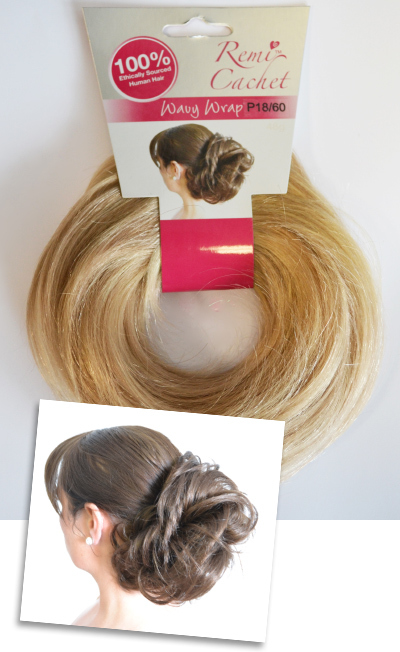 “I love a little narrow ribbon loosely tied to a low ponytail for a pretty feminine touch,” says Tatiana Karelina. 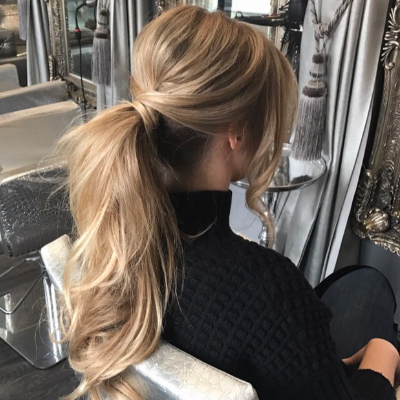 Perfect for creating a simple and easy design within minutes, the Luxe Wrap Ponytail from Hair Rehab London (founded by TOWIE star, Lauren Pope, so she knows her stuff) grips into your own hair using an internal comb and can then be wrapped into place/concealed for a super sleek finish. It’s about 20”, and costs from £94.99. Ooooh you’re spoiled for choice here, with lots of brands playing with pastels and dip dyes and root shadows and more. 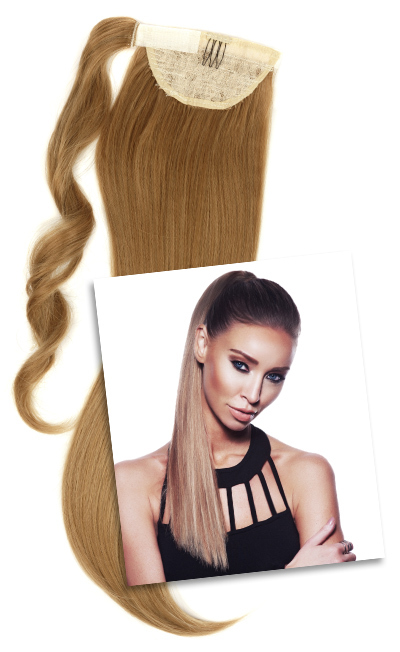 The original clip-in weft from Zen (£85 for a seven piece set of 18″ clip-ins) are available in ombre shades, and are a great starting point. 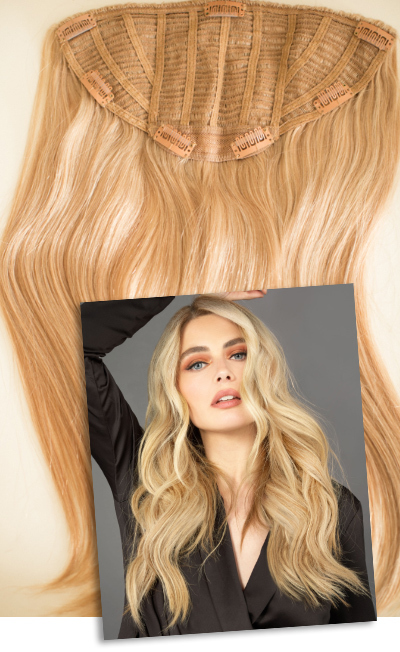 You simply need to start with clean hair and section in the size of the wefts being used… and remember to backcomb to help secure the clip in pieces. Voila! If a full wig is a bit too much, take baby steps, with something like the Luxe Half Wig from Hair Rehab London (from £199). Applied half way back from the front of the face, the Luxe Half Wig hides your own shorter hair underneath using a ‘comb, cap and grip’ design. But keep your own hair loose around your face to keep it all looking natural. 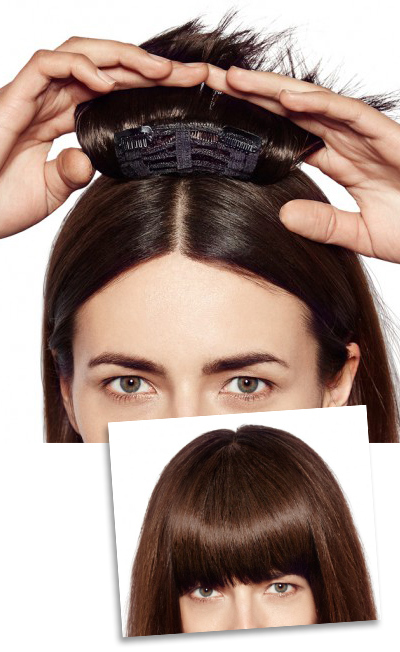 There’s also the Hair Dress (£77.25 – pictured left) from Balmain Paris Hair Couture, which gets you from everyday to elegant in a mere five minutes. It has a cool ombre vibe (the shades are named after global cities – we want the LA!) 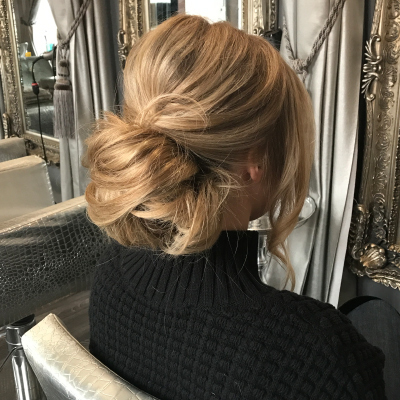 and simply pop the hair on your crown up in a bun for a mo, place the Hair Dress over the top onto your head, and then release your bun and brush it all through to blend. So simple, yet so stunning! 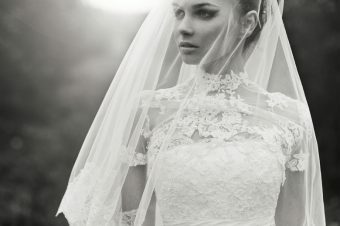 Thinking about hair extensions for your wedding?